A cancer survivor is going big in Times Square in hopes of getting a kidney. Stacey Bell reports. 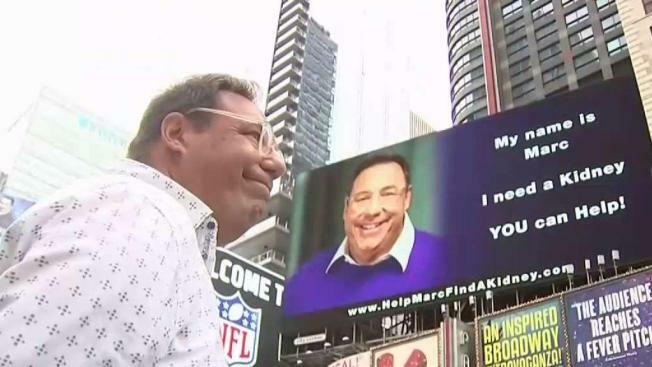 A Long Island man searching for a kidney donor hopes a billboard at the Crossroads of the World will speed up his search. A billboard in Times Square, near the TKTS staircase, bears a photo of Great Neck resident Marc Weiner and the URL to his website, www.HelpMarcFindAKidney.com. Weiner was diagnosed with “aggressive” bladder cancer in 2015 that eventually spread to both of his kidneys, according to his website. Doctors removed his kidneys and bladder to eliminate the cancer, but he’s now forced to undergo “debilitating dialysis three times every week,” he wrote on his site. “And most importantly, it will allow me to live longer, since dialysis takes a tremendous toll on my body,” he added. Weiner works in television news and has a wife and 12-year-old daughter, according to his website. The billboard was donated to him by a friend. “My illness does not define me,” he noted on his site. "Each day I push to be positive and make the best of what is not an easy situation."